Posted in: Uncategorized. Tagged: crops, Fashion, Gorean, JariCat, Paddle, Second Life, SL, Virtual. 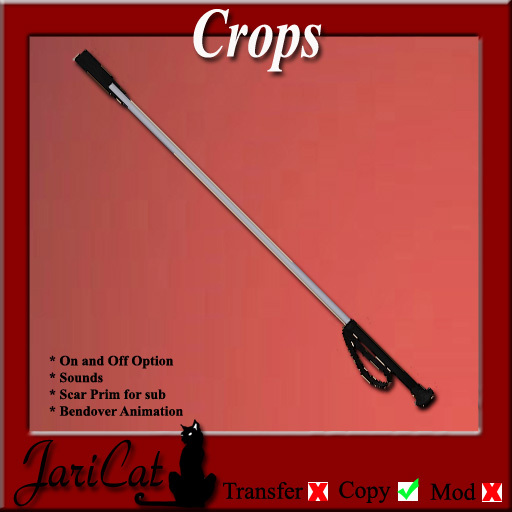 JariCat Fashions extended their collection with a crops and a paddle. The scars you give to your sub or slave to wear. The crops or paddle is standard off, just left click it to turn it on. When your sub/slave wears the scare, walk close to him ( upto 3 meter ) and click with your left mouse on the sub/slave to hit it. You will see it bendsover and you will see the scar appear. Just hold your left mouse on the sub/slaves avatar to keep hitting him/her.